Cheti Chand is the Sindhi New Year and is observed on the first day of the Sindhi Chet month (March – April). Cheti Chand 2019 date is April 7. The corresponding month and date in traditional Hindu calendar is the first day of the Shukla Paksha of Chaitra month. Lord Varuna, the Sea God and God of Water, is believed to have incarnated on the day. There is also a popular belief that Varun Dev appeared as Uderolal on the first day of Chet month to save Sindhis from the demonic rule of Mirkshah. Jhulelal Beda Par! - take us safely to to the other shore is a popular chant and prayer of the community. The day is also known as Jhulelal Jayanti. Jhulelal, also referred as Uderolal, appeared on earth to protect the Sindhi people from persecution. He arrived on earth to defend the faith of the Sindhi people. Makrabkhan, also known as Mirkshah, took over the reins of the province of Thatta, which was inhabited by the peaceful Sindhi community. An Islamic tyrant, he incited the Muslim community against the Hindus and gave the ultimatum to Sindhis to embrace Islam or die. Converting to Islam and abandoning their faith was not possible for the Hindu Sindhi community. The community assembled on the banks of the Sindhu River. On the sacred banks of the river, a bold and brave decision was taken to not to convert. Instead the conglomeration of Sindhis started praying, fasting, and worshiping. There prayer was dedicated to Varuna, the river god. Sindhis in large number took holy dips in the river to propitiate Varuna. The fast became severe with women and children joining in. On the 40th day, the people heard a voice from the sky which said that Varuna will be born as Uderolal in Nasarpur and he will uplift the community during the darkest hour. The words of the Gods from the skies never fail. A child was born to Devaki and Rattanchand of Nasrapur on the first day of Chet month. When the child opened his mouth, people saw the mighty Sindhu River flowing inside the mouth. On the holy river, they saw a serene old man with a white beard sitting on a Pala fish – a fish native to the Sindhu River. People’s prayers were answered and Varuna had appeared on earth to fight the tyranny of Makrabkhan. How Uderolal came to be known as Jhulelal? Legend has it that the cradle on which the baby Uderolal was laid rocked itself to lull him to sleep. Therefore, he was called Jhulelal – the lord of the swing. He whom you call Allah, and my people call Krishna, are but One and the Same. All Humanity is One creation – His Divine Family. It was His desire that He made some as Muslims and others as Hindus. Unity in diversity is what He has ordained – so let it prevail! Do not persecute your Hindu brothers! Let unity prevail among the Sindhi people, so that Hindus and Muslims can exist in peace and harmony. A miracle happened. Arms were dropped. Swords were thrown away. Ignorance and arrogance was replaced with wisdom and piety. Makrabkhan and his army retreated leaving the Sindhi people and their faith untouched. Holy Men from around the world came to see the avatar which melted the heart of a tyrant and his army without using any weapon. The holy men called the child Amar Lal – the immortal one. 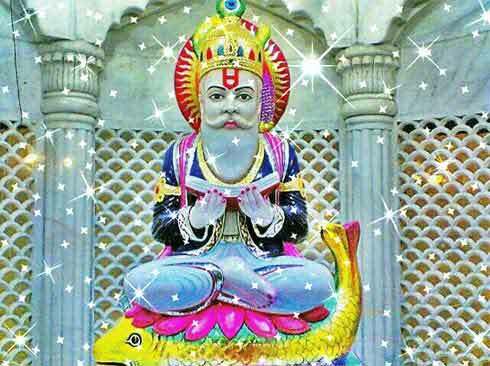 Cheti Chand marks the birthday of Hindu Sindhi community's most venerated religious figure and Ishta Deva Uderolal Jhulelal.